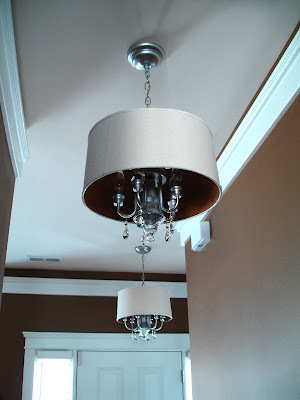 Dwellings By DeVore: Chandelier Reveal! 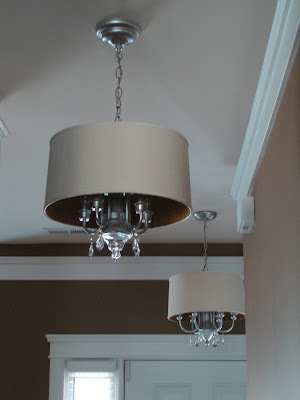 Ok, I am finally done with my chandeliers! It took me a long time to finish these because of some difficulties with the shade. I will share with you what NOT to do as well so you don't make the same mistakes I did. I started out with these two lights from the Restore (they were $15). I'm sure you have seen some like these before. 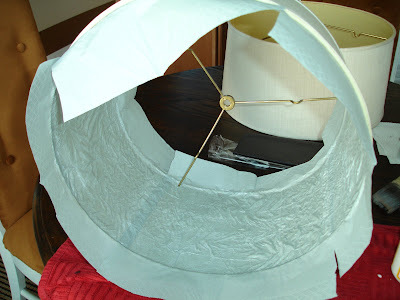 I found two of these lamp shades at the Goodwill for $1.99. I thought they would be the perfect size/shape for this project. 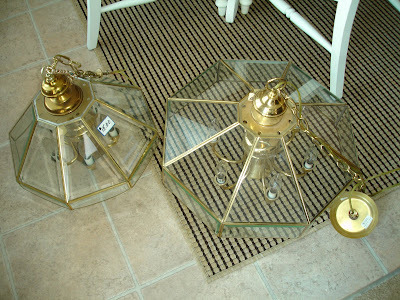 However, the inside of the lamp shades had yellowed and I wasn't crazy about that. So, here's where things started to go wrong. I first got the idea to cover the inside with gray/silver tissue paper but I couldn't find that so I thought a gray napkin would work, boy was I wrong. I took the whole light apart. It's pretty simple you just start unscrewing it and it should all come apart pretty easily. Depending on how many parts and pieces there are, you may want to take a picture of it so you can remember how it goes back together. Once it was all apart, I spraypainted it a metallic silver color. 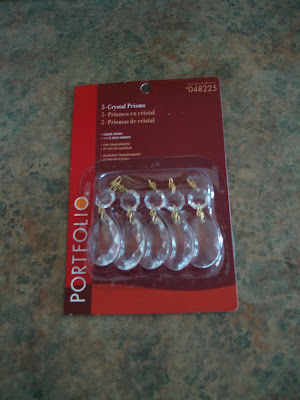 Then I attached some of these crystals from Lowe's to the arms using some fishing line. you never cease to amaze me. And the grand total for your project?? How much did this fabulousness cost you? They look great! Very creative. Excellent! I was afraid when I saw the first picture, but these turned out fantastic! They look like they cost hundreds of dollars, but I love that they didn't! Thank you all so much! Amory, I think the total cost for each one was around $25. No way! You did such a great job! That is beautiful! After all of that they still turned out perfectly and for $25 are a definite steal! fabulous! I knew I had an amazing neice! actually 2! These are just lovely! What a great job. Way to persevere all the way to the beautiful end! Wow- that turned out fantastic! 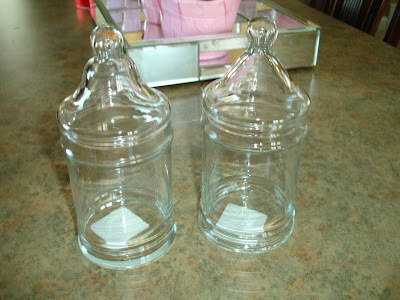 I love the addition of the glass jar lid to the bottom- perfect! That is so cool! I'm loving this redo! So unique! BRAVO!!!! really great post! very very cool idea! loved it! thanks for sharing! ABSOLUTELY BRILLIANT! Never would have guessed what they used to be. I loved it so much I had to feature you on my blog. Hope you don't mind...(if so, let me know). that is CRAZY awesome! I never would have thought of that in a million years. What a great transformation! Wow, awesome idea and great execution!! 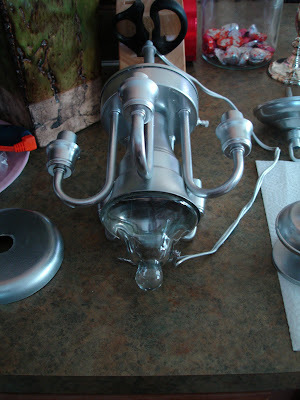 Can you share which spraypaint type/color you used on the fixture? I just bought some metallic silver spray paint and it's not doing a very good job of covering! Wow is all I can say. I am floored. They look fantastic! Briliiant!! Thanks for the inspiration and ideas. I think these are genius. They look so expensive ! OMG! You are the bomb diggity! lol! Seriously what you did was super awesome!!! Amazing! Thank you so much for posting this, I see these lamps at my local thrift stores all the time. They look beautiful! Thank you thank you!!! 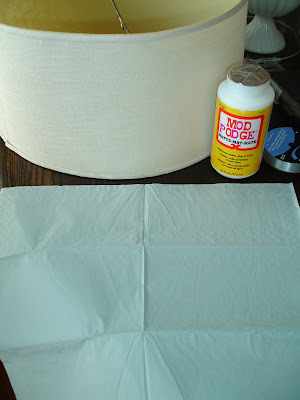 Carrie, I used Rustoleum Silver Metallic spraypaint. It has great coverage! These came out great. I love your cleverness with the apothcary jar lids. I want to update a light of my own - this is truly inspiring. Wow, that is gorgeous!!! I want to make one! I used to have one of those ugly glass chandies. That is an amazing idea! I've seen your amazing lighting transformation on several blogs now, and each time I'm equally as amazed. 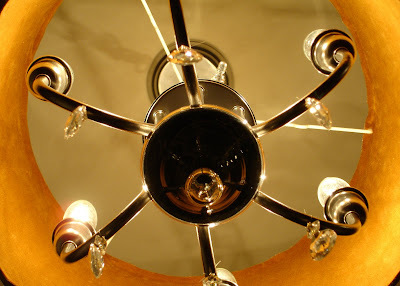 I consider myself a pretty creative person, but never in a million years would I have seen those ugly "before" chandeliers and given them any thought. Truly amazing. I love this! I think I am going to attempt my own version in coming weeks. Thanks so much for sharing. What did you use to paint the brass? 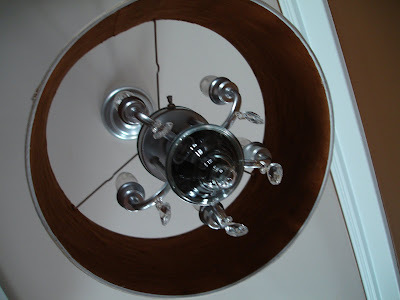 You've inspired me to redo the light fixture in my foyer (circa 1979). 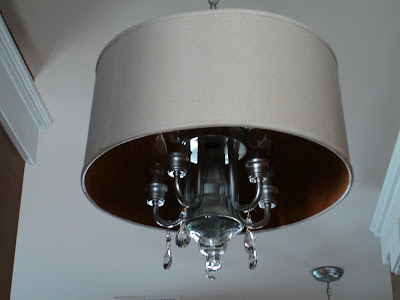 My husband will be so happy that I'm not buying a whole new fixture! Haha! Ames726, I used Kilz primer to prime it and then I used Rustoleum silver metallic spraypaint. I would love to see it when you finish! Amazing! I love this! I'm so going back to the thrift store I saw one of those lamps at yesterday. I hope it's still there! Great job! Whoa! I'm seriously impressed! I would have NEVER thought of that! They look fantastic! I love that you would never know that they were such dated, gross fixtures before. The transformation is amazing! SO creatve and really beautiful! This is marvelous and I can't believe that I haven't come across it before now. I would love for you to share this on my party tomorrow (link is already up). I'm your newest follower and I invite you to do the same! Wow, I am HIGHLY impressed at your creativity. How innovative! Thanks for sharing. stunning idea, seriously! so creative of you. Now THAT is a transformation. No one will guess you made these yourself! This is such a fabulous project!!! I love it. LOVE IT! I'm featuring this in a post on pb inspired things tomorrow on crazydomestic.com. Feel free to grab our "I was featured" button! WOW, I can't believe the old lighting turned into such an awesome final product, very nice! 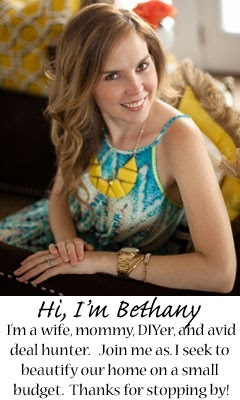 I discovered your blog today via The Inspired Room on facebook. Your blog is amazing, you are so talented and creative! I soooo love this redo! 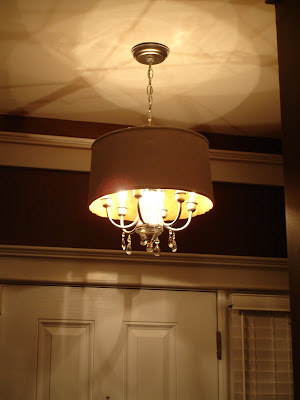 I was looking at a similar type of chandelier on overstock that runs for over $100. Now if I can find the original glass ones to transform them into what you created! I'll keep my eyes out for sure! Thank you! Creative genius -- very artful solution! Wow, wow and WOW. Do you think an "average -to-slightly-impatient DIY'er could do this herself? Very creative! They look fantastic. Particularly ike the addition of the glass canopy base.